Excerpt from Summer Sizzle Keyboard Kamp Brochure (2019): Personal Original Composition Class: Summer Sizzle Keyboard Kamp is offering participants the opportunity to submit only one of their own original compositions no later than May 15th, 2019. Each composition will be reviewed by a visiting Canadian composer prior to Summer Sizzle. During Summer Sizzle students will perform their original composition for their assigned group. Compositional techniques will be discussed as a whole with the group during this class. Please note that although the composition class is a group activity, the submission of an original composition is optional. ​Selected submissions received by the deadline may be published in a Summer Sizzle student composition collection available at Summer Sizzle. Some students may be invited to perform their own composition at the student composition recital. 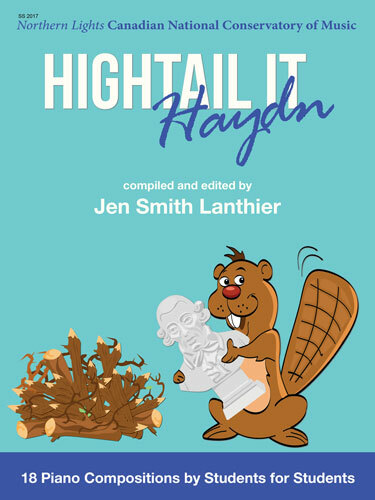 NEW - Fingerprints From Biggar is the eighth book in an exciting collection of piano solos composed by young musicians who participated in the Northern Lights Canadian National Conservatory of Music Summer Sizzle 2018 program. Each work is an original composition written by eleven young Canadian composers under the age of eighteen. Works include jazz and popstyles, as well as character pieces and romantic style works at various levels. 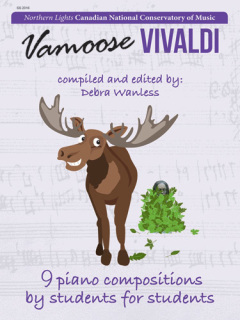 Vamoose Vivaldi is the sixth book in the ongoing collection of piano solos composed by young musicians who participated in the Northern Lights Canadian National Conservatory of Music Summer Sizzle 2016 program. Each work is an original composition written by nine young Canadian composers ranging in age from nine to fourteen. Works include jazz and pop styles, as well as romantic and contemporary sounds at various levels. So – Vamoose Vivaldi! Beat it Beethoven is the fifth book in the ongoing collection of piano solos composed by young musicians who participated in the Northern Lights Canadian National Conservatory of Music Summer Sizzle 2015 program. Each work is an original composition written by eight young Canadian composers ranging in age from seven to sixteen. Works include jazz and pop styles, as well as romantic and contemporary sounds at various levels. 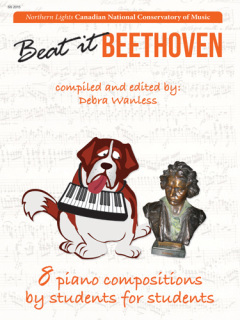 So – Beat it Beethoven! 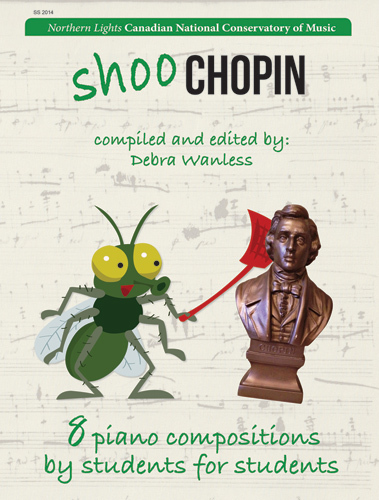 Shoo Chopin is the fourth book in an exciting collection of piano solos composed by young musicians who participated in the Northern Lights Canadian National Conservatory of Music Summer Sizzle 2014 program. Each work is an original composition written by eight young Canadian composers ranging in age from seven to sixteen. Works include jazz and pop styles, as well as romantic and contemporary sounds at various levels. So – Shoo Chopin! 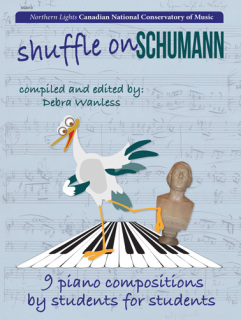 Shuffle on Schumann is another new and exciting collection of piano solos composed by young musicians who participated in the Northern Lights Canadian National Conservatory of Music Summer Sizzle 2013 program. Each work is an original composition written by nine young Canadian composers ranging in age from ten to fourteen. Works include jazz and pop styles, as well as romantic and contemporary sounds at various levels. 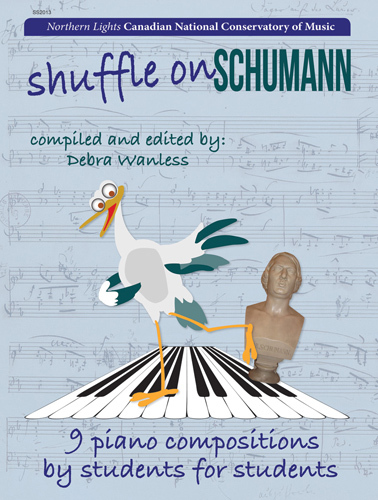 So – Shuffle on Schumann! Back Off Bach is an exciting new collection composed by young musicians who participated in the Northern Lights Canadian National Conservatory of Music Summer Sizzle 2012 program. Each work is an original piano composition written by 15 young Canadian composers ranging in age from eight to fifteen. Works include jazz and pop styles, as well as romantic to contemporary sounds at various levels. 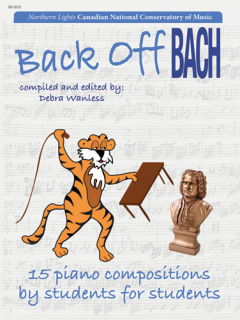 So - Back Off Bach! 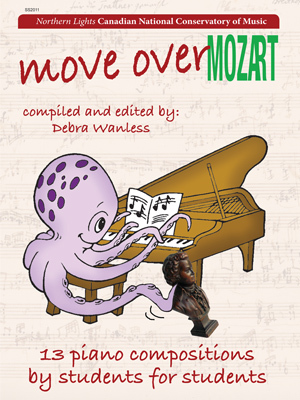 Move Over Mozart is an exciting new collection composed by young musicians who participated in the Northern Lights Canadian National Conservatory of Music Summer Sizzle 2011 program. Each work is an original piano composition written by 13 young Canadian composers ranging in age from eight to fifteen. Works include jazz and pop styles, as well as romantic to contemporary sounds at various levels. So - Move Over Mozart!